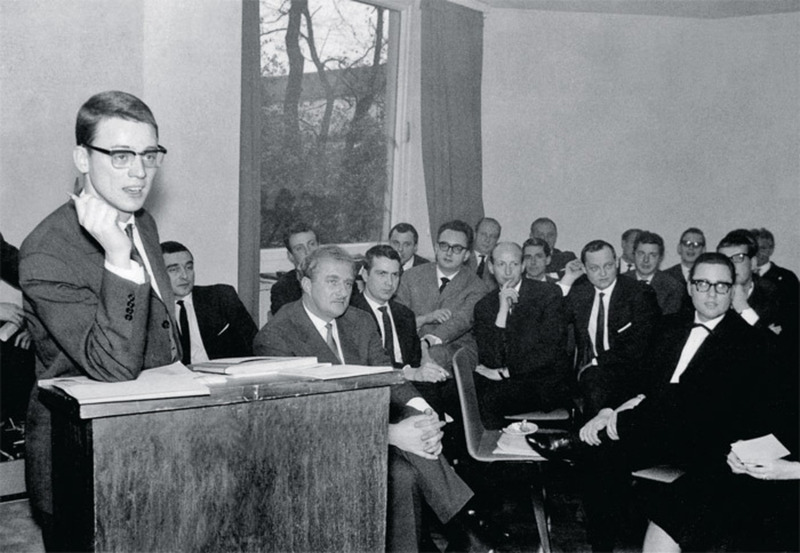 Alexander Kluge presenting the Oberhausen Manifesto at a press conference during the International Short Film Festival Oberhausen, Germany, February 28, 1962. 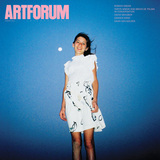 “Oberhausen Manifesto 1962: Short Films by the Signatories, 1958–67” runs at the Museum of Modern Art from Thursday, September 27–Sunday, September 30, 2012. By the time that issue of Filmstudio appeared, the manifesto in question was well known, even notorious, among observers of the film scene in the Federal Republic of Germany (FRG), who were fiercely divided in their reactions to the dramatic intervention of twenty-six brash young and aspiring filmmakers at a press conference held on February 28, 1962, during the International Short Film Festival Oberhausen. In an expression of Oedipal outrage, these earnest young menand it bespeaks the times that they were all menassailed what they deemed to be a spiritually arid and intellectually bankrupt national cinema, announcing their intention to bring to it creative redemption and intellectual renewal. Blending harsh critique with constructive resolve, the succinct statementits concision itself a blunt instrumentannounced “the collapse of the conventional German film,” reiterating the news of its demise in the emphatic closing, which declared that “the old film is dead” before expressing a certain optimism: “We believe in the new one.” Both a devastating prognosis and a program for renewal, the document demanded a departure from the past and sketched a design for the future. Indeed, this promise of a fresh start bore a curious resemblance to the wishful thinking of Stunde Null (or “zero hour”) rhetoric that had circulated in Germany directly after World War II, with its tacit belief that one might start from scratch. This fabled document, now hallowed as the Oberhausen Manifesto, provided the founding myth for what would become the Young German Film and, later, the New German Cinema. Against formidable odds, the manifesto precipitated radical changes in the way films in West Germany were funded and made, and it profoundly changed the equation with respect to the question of who would make them, with an immediacy, a vehemence, and a pertinacity that are truly astonishing. (One need only compare the efficacy of Oberhausen to that of the “First Statement of the New American Cinema Group,” also issued in 1962, to prove the point.) And if only a very few of the filmmakers who endorsed the statement would ultimately achieve some measure of international renown, the manifesto undeniably forced the opening that made possible the extraordinary creative outpouringsof the likes of Werner Schroeter, Volker Schlöndorff, Rainer Werner Fassbinder, Wim Wenders, and Werner Herzogthat put German film at the forefront of international cinema during the 1970s and ’80s. As we celebrate the fiftieth anniversary of the document’s signing, we would do well to recall the energies that spawned this now legendary pronouncementand gave it such potency. But, at the same time, we must be alert to the more ambivalent (and less commented on) aspects of this remarkable legacy. The Oberhausen activists included twenty directors, only three of whom (Ferdinand Khittl, Hans-Jürgen Pohland, and Herbert Vesely) had yet completed a feature. But more modest formats, they argued, even if driven by necessity, had provided their generation an arena in which to experiment and take risks, and in this way foster a new language of cinema. Short films by young German cineasts such as Alexander Kluge and Edgar Reitz, the manifesto proclaimed (without naming names), had made a splash at international festivalsand indeed it is true that these works had generated enthusiasm among foreign journalists and had brought attention to German cinema as a site of vanguard endeavor for the first time since the Weimar Republic. This awareness of the value of international prestige was prescient in its recognition (now taken for granted) of how powerful a bargaining chip praise from abroad could be: In subsequent years, the New German filmmakers would become masters in the triangulation of desire, using their festival successes and art-house triumphs abroad as means to legitimate their endeavors at home and to secure funding for future productions. Beyond that, the manifesto asserted, this new cinematic language (the nature and very existence of which, it should be noted, is asserted without further elaboration), forged in the crucible of the short film, must now transform the feature-length film. But, for this to happen, dramatic change would need to take place in West Germany: Artists would have to be freed from outmoded conventions, commercial pressures, and external interventions. With great (and, given their relative lack of experience, not altogether justified) certainty, the group asserted that they had “concrete intellectual, formal, and economic ideas” about the kinds of films they would make and how they would go about making them. Likewise, the signatories acknowledged their willingness to bear financial burdens. Wim Wenders, Alice in den Städten (Alice in the Cities), 1974, still from a black-and-white film in 16 mm, 110 minutes. Alice (Yella Rottländer) and Philip Winter (Rüdiger Vogler). Pulling the emergency brake on the speeding express train of history, the Oberhausen signatories demanded a change of course. The moment was right: West German film wasin this regard there seemed to be little disagreementa national embarrassment. The crisis of “Papa’s cinema” coincided with the bitter end of Konrad Adenauer’s administration and the so-called Spiegel affair of 1962, a public scandal that ultimately led to the aging chancellor’s resignation. Although there had been several attempts to foster renewal in the West German film scene, none of these previous endeavors (e.g., the “Memorandum Regarding a New German Film” of 1946 or the subsequent formation of DOC 59, a collective of documentarians, cinematographers, composers, and critics) had gained traction. The drafters of the manifesto gathered on a January evening in a back room of the Chinese restaurant Hongkong on Munich’s Tengstraße. The critical thrust of Klugethe key spokesperson for the group and a writer and lawyer of some reputation, as well as a good friend of the social theorist and philosopher Theodor W. Adornovery much influenced the shape of the plan for a radical transformation. The envisioned film culture was to take its place within a more inclusive and dynamic public sphere. It would reflect the thoughts and energies of a younger Germany, a generation that had been doubly disfranchised, both as producers and as spectators. Its proponents would initiate dialogue with representatives of the other arts (e.g., members of the Bauhaus and the literary association Gruppe 47, as well as exponents of avant-garde music and modernist art) so that film in the FRG might be freed from its intellectual isolation. Cinema, argued Kluge, should foster a more encompassing and expansive sense of reality and become a site of alternative expression; it would dare to be different and militate against conservative forces. Any creative renewal, the Oberhauseners realized, would necessitate dramatic changes in material arrangements so that economic criteria would no longer stand as the sole measure of quality and success. Ferdinand Khittl, Die Parallelstraße (The Parallel Street), 1962, stills from a color fim in 35 mm, 86 minutes. The proclamation of the manifesto occasioned much critical comment. As one might expect, established members of the film industry and the conservative press ridiculed the young men for their audacity, linking their inflated rhetoric to that of the great liar of lore, Baron Münchhausen, and calling them Obermünchhausener. 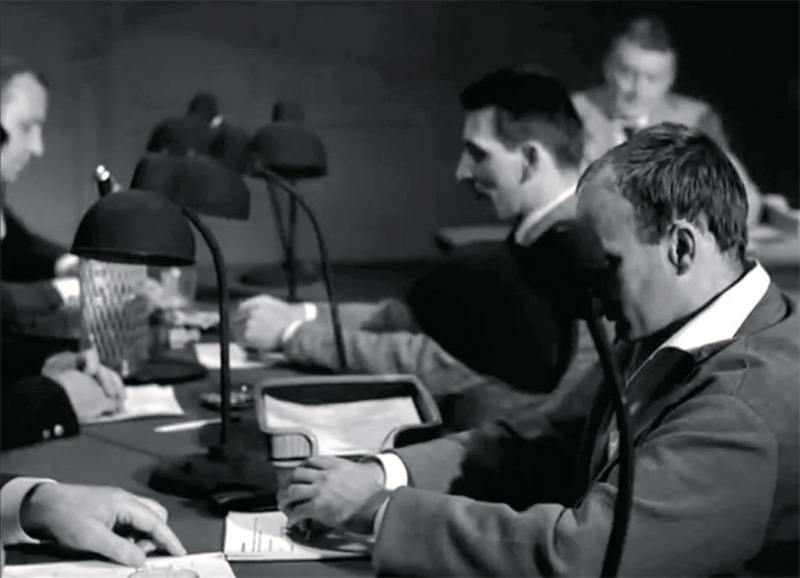 Nevertheless, despite substantial opposition, the initiative proved a valuable catalyst with significant and lasting results, including, but not limited to, the founding of film academies in Ulm, West Berlin, and Munich, and the formation, in February 1965, of a government funding agency, the Kuratorium Junger Deutscher Film, which provided the impetus for the large network of federal and regional agencies subsequently created to subsidize film production in Germany. The manifesto, furthermore, triggered an impressive wave of features in 1966 aloneUlrich Schamoni’s Es (It) and Schlöndorff’s Der junge Törleß (Young Törless) premiered at the Cannes film festival, where the latter received the International Critics’ Prize; a few months later, Peter Schamoni’s Schonzeit für Füchse (No Shooting Time for Foxes) garnered a Silver Bear at the Berlinale; and that fall, Kluge’s Abschied von gestern (Yesterday Girl) was awarded a Silver Lion at the Venice Film Festivaland all but the first of these films, it should be noted, had received support from the Kuratorium. Critics from a host of countries celebrated what quickly became known as Young German Film. In time, auteurs from West Germany, their careers made possible by the cultural opening forged at Oberhausen, would gain a substantial profile as pliers of the New German Cinema, arguably the most significant national film movement of the 1970s. AS A FOUNDING MYTH for a cinema of auteurs that attained international prominence, Oberhausen provided an impressive point of departure. As a collective enterprise, the manifesto certainly marked a significant juncture where a number of creative and ambitious filmmakers came together and, for all their differences, spoke out in the name of a utopian vision. Given the historical moment, their outspokenness was understandable and, in light of their marginal status, necessary. Looking back at this foundational text with the distance and disinterest a half century affords, we can now see not only the very real achievements of Oberhausen but the sometimes problematic consequences of the heroic narrative it gave rise tothe oversights and exclusions, the denial and distortion such mythomania invariably entailsand therefore also the need to reconsider the historical record and retell the tale. The heroic narrative, for instance, conveniently overlooks the fact that the Oberhausen activists occasioned criticism not just from the established film industry but from fellow independent filmmakers. The signatories were vigorously attacked by Rudolf Thome, Roland Klick, and Klaus Lemke, for example, as well as by Jean-Marie Straub and Danièle Huilletdirectors loosely referred to at the time as the New Munich Group, whose dissatisfaction with the Oberhauseners ranged from political objections to reservations about discursive strategies and aesthetic directions. And indeed, even the Oberhausen collective itself was never an uncontested and united fronta delicious irony given that this gathering of filmmakers, most of whom operated out of Munich, presumed to speak for German film as a whole. But perhaps the greatest distortion perpetuated by the Oberhausen myth lay in its followers’ unthinking acceptance of the manifesto’s implicit claim that no sign of life could be detected anywhere in German film beyond the fledgling efforts of the signatories themselves. This was to willfully ignore the nascent alternative cinema that in fact existed in the FRG in the ’50s. (Take, for instance, the significant avant-garde endeavors of Ottomar Domnick, a filmmaker whose work is ripe for rediscovery.) Neither does the manifesto make any mention of film production in the German Democratic Republic; indeed, as was common at the time, the Oberhauseners spoke of German film as if the FRG were the only Germany. In that regard, their manifesto, for all its critical intent, remained a Cold War document. Its conspicuous lack of female voices likewise reflected the patriarchal dispositions of the era. Finally, the Oberhausen Manifesto and the New German Cinema, very much in accordance with the ideological critiques of Siegfried Kracauer and Adorno, shared a marked displeasure at films that simply affirmed the status quo. As a purveyor of distraction and products of a wannabe culture industry, the Adenauer era’s popular cinema had no progressive advocates. Moreover, as symptoms of a society ostensibly beset by collective amnesia, this fantasy warein keeping with Alexander and Margarete Mitscherlich’s influential thesis about repressed guilt in postwar West German culture at large (set out in their seminal The Inability to Mourn: Principles of Collective Behavior )took flight from the past and failed to confront and work through its collective investment in a problematic heritage of authoritarianism and violence. Oberhausen’s auteurist initiative, the antiauthoritarian ferment of 1968, and the reformative designs of the New German Cinema have played a strong, indeed predominant, role in the way in which commentators have approached the FRG’s films of the ’50s and early ’60s. But over the past few years, film scholars and cineasts have begun to revisit and reevaluate Adenauer-era productions and, in so doing, to challenge the central premise of the Oberhausen Manifesto. The master narrative, in which a limp “Papas Kino” simply shriveled up and faded away in response to the young Turks’ Oedipal uprising, has come to seem decidedly contrived, for this mainstream cinema proved to be far more vital than its young adversaries made it out to be. Fassbinder (whose death thirty years ago this June marked another key juncture in postwar German film history) was not the only one of his peers to find a productive working relationship with representatives of the older generation. He also was not the sole New German filmmaker to look back at the Adenauer era and its mass culture with a regard both fond and critical and to acknowledge certain of his immediate precursors’ importance with respect to his own output. Several recent retrospectives in Germany (most recently at the Zeughauskino in Berlin) now seek to demonstrate that the film culture denounced wholesale by the Oberhauseners was perhaps not so dead after all. Christian Petzold, Jerichow, 2008, still from a color film in 35 mm, 93 minutes. Laura (Nina Hoss). AS WAS EVIDENT ALREADY in its first bloom, the “cinema of authors” that we can trace back to Oberhausen was proud and willful, both self-important and self-indulgent. Its practitioners viewed their convocation as a gathering of Davids waging war against an army of Goliaths. Without question, this German template exercised a strong influence on subsequent attempts in the United States to conceptualize an independent cinemafrom the countercultural ambitions of the renegades behind Easy Rider in 1969 to the anti-Hollywood aesthetic of Jim Jarmusch and Amos Poe in the ’80s to the delusional messianism and breathtaking self-regard of today’s auteurs maudits such as Gregg Araki, Vincent Gallo, and Harmony Korine. Indeed, New German Film constituted a proto-independent cinema long before there was a Sundance Institute or an Independent Film Channel. Its members, both colleagues and competitors for pieces of a never-large subsidy pie, were mavericksindies avant la lettrewho defied integration into the dominant cinema and whose very strength and identity rested in their difference from and resistance to the mainstream. The Oberhausen signatories revolted against codified ways of seeing and sought to redefine film and reinvent the cinema; they privileged “alternative images” (Gegenbilder) and more expansive and complicated understandings of reality, perspectives that were at once unvarnished and outlandish. Difficult and demanding, the new German Autorenfilm would perhaps be taken as seriously as it was abroad precisely because it was so vehemently disliked at homerendering it an eccentric cultural ambassador that spoke for the nation often by speaking (and acting out) against it. It was vulnerable yet fierce, precarious yet nonetheless firm in its position, and uncompromising in its insistence that films did not always have to be popular or pleasing in order to justify their existence. It stands to reason that representatives of the so-called Berlin School, a countercinema that since the turn of the millennium has gained wide regard as a German new wave, have played a prominent public role in recent remembrances of Oberhausen. Young directors such as Christian Petzold, Christoph Hochhäusler, and Angela Schanelec share an aesthetics of reduction and restraint, a penchant for image-focused rather than plot-driven constructions. Quite adamantly, the adherents of the Berlin School assail the disregard for reality of many recent German features, this contemporary commercial cinema’s absurd contrivances, implausible constructions, and spurious harmonies, especially Nazi-Stasi retro films like Der Untergang (Downfall, 2004) and Das Leben der Anderen (The Lives of Others, 2006). Very few German productions, Petzold insists, disclose what today’s Federal Republic really looks like and grant a more profound sense of what it feels like to reside in contemporary Europe. Respecting the weight of images and recognizing the substantial ethical responsibility of a medium that traffics in facsimiles of the real, Berlin School productions have reanimated international enthusiasm for a nation’s film culture that had become insignificant and all but invisible beginning in the mid-’80s, after the death of Fassbinder and, with him, the demise of an Autorenkino. As a bastion of observation rather than fabrication, the Berlin School has revived and updated the critical and creative resolve articulated half a century ago by a group of young activists, confirming that the incentive of Oberhausen has not diminished in its urgencyor its ongoing importance. Eric Rentschler is the Arthur Kingsley Porter professor of Germanic languages and literatures at Harvard University and the author of West German Film in the Course of Time (Redgrave, 1984), among other titles.